In August 2012, then deputy governor of the Reserve Bank of India (RBI) K.C. Chakrabarty laid bare banks’ rampant misuse of the practice of restructuring loans. With damning data, Chakrabarty pointed out that lenders are giving a free pass to corporate borrowers in the name of corporate debt restructuring (CDR) knowing well that firms will not be able to service loans for a long time. Chakrabarty’s speech is more relevant now than before. 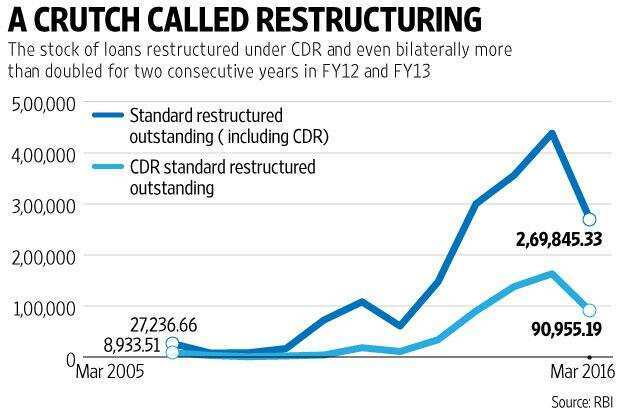 Chart 1 shows the loan stock under CDR and overall restructuring, including bilateral, rose sharply for four consecutive years with an alarming rise of more than 100% in FY12 and FY13. A doubling of restructured loans in a single year should have raised red flags among banks and even the RBI. But it didn’t and that is the time banks misread the cues. Many lenders were hopeful that the economy would turn around and stalled projects would begin to generate cash flows to make loan repayments easier. In the following two years, the rise in the restructured loan stockpile was slower but it was largely due to a hike in provisioning of restructured accounts. The drop in restructured loan stockpile in 2015-16 is mainly because the RBI removed all forbearance on such accounts, forcing banks to label them as bad. Now look at Chart 2 that details how the bad loan stockpile changed over the last decade. Between FY12 and FY16, bank credit rose at a compounded annual growth rate (CAGR) of 9.65%. But the stock of standard assets grew at a marginally slower pace of 8.57% CAGR. Bad assets grew by 34% but what is interesting is that doubtful assets grew by a massive 42% CAGR. 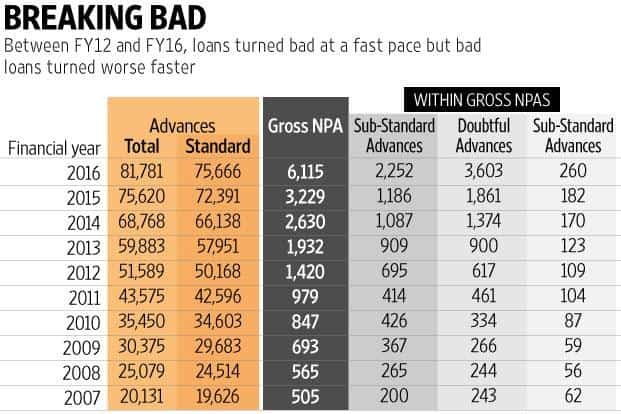 What this means is that not only loans were turning bad faster, bad loans were getting worse even faster. It is not unfair to expect bankers to know what was going on. As a corollary, Chart 3 shows how companies have begun defaulting on their bond repayments as well. This is only a slice of a larger picture as a large stock of bonds is unrated in India. Also, many of the prominent distressed corporate groups that are NPA (non-performing assets) on banks’ books do not borrow from the bond market. 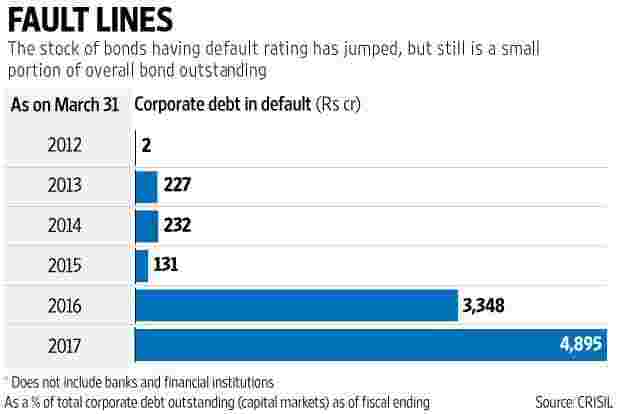 According to Crisil Ratings, Rs131 crore worth of bonds (out of the Rs3.73 trillion it rated) had a default rating in FY13. This surged to Rs4,895 crore by FY17. Since access to the bond market is enjoyed by the highly rated companies, it should be worrying that fissures are visible here too. This is the third and final part of the three-part series on the evolving situation of corporate credit quality. You can read the first part here, and the second part here.